Video games have become a ubiquitous part of our world. Starting with the first arcade cabinets in 1971, these games have grown to a multi-billion dollar industry, and an enormous part of the US economy. As such, these games have become inextricably linked to the principles of late capitalism and the problems of modernity. By creating “home-brewed” games or hacking game hardware, individuals regain ownership of their gaming practices, and video gaming becomes a creative pursuit. In Plurality Spring, players perform music to control robotic avatars exploring an unknown orb in deep space. Using the microphone to track pitches, the live acoustic player/performers control the movement of the robots as well as the emergent sonic environments. The piece is both a standalone game and a framework for musical improvisation. The live acoustic audio mixes with in-game sound, creating an emergent augmented reality musical performance. Randomized levels, real-time decisions, and reactive audio lead to distinct musical results with each playthrough. Rhythcremental is a hybrid of a drum machine and incremental games like Cookie Clicker. Enter a neon, retro cyberspace where you collect “power” to move faster and jump higher. Games and music are both art forms that unfold over time, and the craft of these works lies in shaping and pacing how the piece unfolds. Composers and game designers both create the environments, but it is up to a performer or player’s navigation of this environment to create the experience. In music, though, usually the performer and audience are usually separate entities, with the performer crafting the experience for the audience. In my Nebula Variations the player takes on the role of both performer and audience member, crafting and enjoying a unique musical work in real time. A keyboard controlled 1980s speech synthesizer. 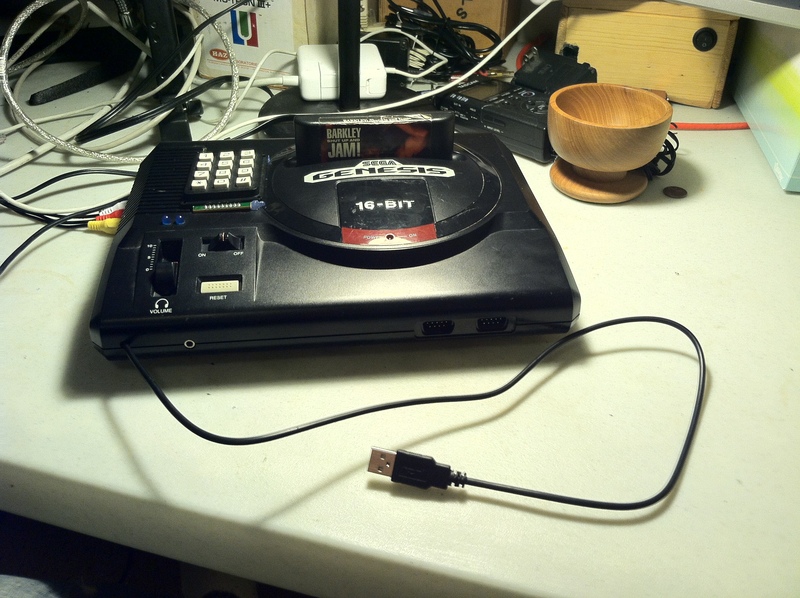 This is a video-bent Sega Genesis, whose video glitches (created by bridging points in the video-RAM) can be controlled interactively via the keypad or by USB MIDI Control using an Arduino Teensy installed into the Genesis. This piece of obsolete consumer technology has been repurposed into an instrument for creating live interactive art.